My baby Marcie does. The cradle cap developed the same time as her eczema rash, at about 2 weeks old. It’s greasy, yellow, crusty and difficult to scrape off. I applied olive oil onto the cradle cap, and combed it off when the crust soften. Cradle cap can develop above eyebrows and inside the ears too! Cradle cap is caused by overactive oil glands and usually occur in infants. I was told by doctors that it’s related to eczema and can last up to 2 years old. Marcie still has it but it is no longer as pervasive. It’s itchy for her though and I do apply 0.05% steroid lotion when the scratching is really intense. 1. Use a cradle cap shampoo. I use it once a day for Marcie and realised that you have to massage the scalp quite firmly in order for it to be effective. 2. Brush baby’s hair and keep it short. I find that once Marcie’s hair is longer, she gets warm and somehow starts scratching. I’m not sure if it has anything to do with cradle cap, but I’m not choosing beauty hair over comfort. 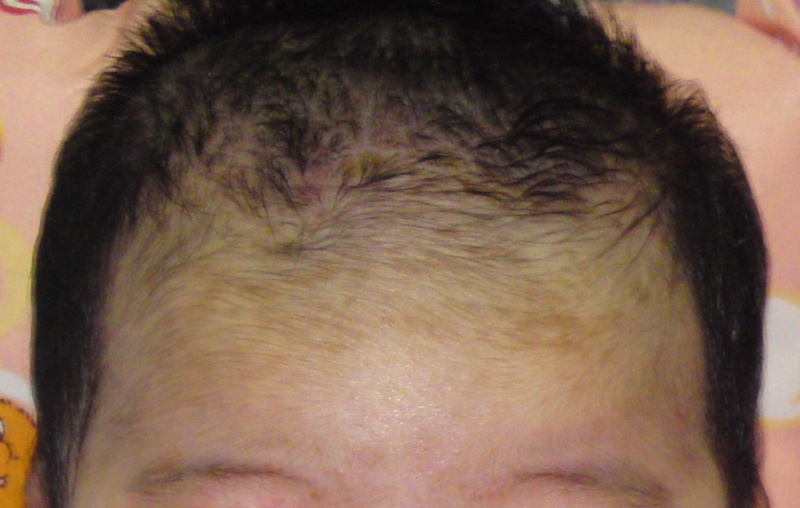 Lastly, know that cradle cap will eventually go away in a few months time. So take a deep breath and not let the crust ruin your day. A quick update: My baby is 2 year old already, and we just switched her to Gaia Skin Natural Baby Shampoo. So far seems ok, but she still always scratched after shampooing, even if we use plain water. Still trying to find an answer to that. Sorry to hear that you’re not coping well. Eczema is a chronic condition, so we have to be mentally prepared to manage our child’s eczema over a period of time. Do visit a specialist doctor, understand what triggers your child’s eczema (get a skin prick test) and it’d then be easier to manage the eczema. Take care. The hair did finally grow back by around 1.5 year old.